1 Peter 5:1-3 So I exhort the elders among you, as a fellow elder and a witness of the sufferings of Christ, as well as a partaker in the glory that is going to be revealed: (2) shepherd the flock of God that is among you, exercising oversight, not under compulsion, but willingly, as God would have you; not for shameful gain, but eagerly; (3) not domineering over those in your charge, but being examples to the flock. 1 Timothy 6:9-10 But those who desire to be rich fall into temptation, into a snare, into many senseless and harmful desires that plunge people into ruin and destruction. (10) For the love of money is a root of all kinds of evils. It is through this craving that some have wandered away from the faith and pierced themselves with many pangs. 1 Corinthians 9:14 In the same way, the Lord commanded that those who proclaim the gospel should get their living by the gospel. How is it that the mass of Christians today are being largely taught by celebrity leaders in the visible church who are growing quite wealthy from the proceeds of their “ministry”? The ones who are writing the books we read, who publish the study Bible notes, who make the Christian conference rounds as featured speakers, who pastor the “notable” and mega churches? Why are we not insisting that their incomes be made public? Revelation 3:15-17 “‘I know your works: you are neither cold nor hot. Would that you were either cold or hot! (16) So, because you are lukewarm, and neither hot nor cold, I will spit you out of my mouth. (17) For you say, I am rich, I have prospered, and I need nothing, not realizing that you are wretched, pitiable, poor, blind, and naked. A minister of the gospel is deserving of a living. There are churches who intentionally and unnecessarily keep their pastor in poverty so the “pillars” can more easily keep him under control, and that is an evil sin. But here we are speaking of the opposite wickedness – a minister gaining fame and fortune from the ministry. Pride is dangerous. Wealth is dangerous. And wealth stockpiled from doing “the Lord’s work” simply cannot be justified. It is long past time for Christ’s people to insist on full disclosure in regard to the financial status of the pastors, theologians, and authors who are teaching them. In most local churches this is already done annually in the published church budget. But there are celebrity leaders who are writing the notes in our study Bibles, the books that we are told are “must reads,” who are speaking regularly on the “christian” conference circuit, who are selling their sermons and taking salaries from their “non-profit” ministries that so many people listen to unquestioningly who are not being held accountable. Do you really want to be taught by and do you really think you should trust the teaching of someone who has grown rich and continues to do so as a result of their stated “ministry”? How much of the “Bible truth” we are being fed has been polluted by the influence of money and the love of it? How many decisions in local churches and other Christian ministries are void of justice because money has swayed the verdict? No matter who a person is, no matter how soundly they appear to have begun in the service of Christ, wealth remains a danger and we are very foolish if we think that it is not having an effect on these people. They won’t hear me, but I will ask the question and issue the challenge myself. I call on such leaders in the church to full financial disclosure in regard to monies earned from any and all of the entities they are involved with that claim to serve Christ. And I would go further. I would challenge them to stop receiving wealth that they do not need. Any ministry entity that is paying large sums to their leaders, beyond what is really necessary and commensurate with the culture they are in, is working to the corruption and destruction of those leaders. Human beings are human beings. Wealth and fame corrupt. 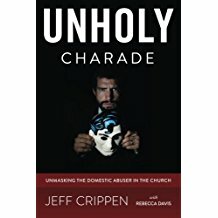 I have to post this right away because it is soooo false and so incredibly damaging to victims of evil ones (like domestic abusers hiding in the church) and so enabling to the wicked. It is a quote from a pastor who claims to be an expert on domestic violence and who has been rather successful at putting himself off as such. His message, he says, is one of “hope.” But it is anything but that for victims. 1 Corinthians 5:2 And you are arrogant! Ought you not rather to mourn? Let him who has done this be removed from among you. Does Scripture teach us that all people, including Christians, are sinners and in fact sinners of the same category as those who creep in among Christ’s flock and work to destroy their souls (which is what these domestic abusers who hide in churches in disguise are doing). Of course not! Question: How does the gospel speak into, heal, and really answer the problem of domestic violence and how might we hope in Christ in the midst of a dark, broken Genesis 3 world where it seems like domestic violence abounds? Answer: I want us to be a voice of hope because there are a lot of voices out there speaking to this topic and many of them can be angry, can be resentful and somewhat rightfully so. But I think the church can be a voice of hope here. Not hope for marriage restoration, but hope for the glory of God and the advancement of the gospel, which is our best hope for marriages moving forward. 1 Corinthians 6:9-11 Or do you not know that the unrighteous will not inherit the kingdom of God? Do not be deceived: neither the sexually immoral, nor idolaters, nor adulterers, nor men who practice homosexuality, (10) nor thieves, nor the greedy, nor drunkards, nor revilers, nor swindlers will inherit the kingdom of God. (11) And such were some of you. But you were washed, you were sanctified, you were justified in the name of the Lord Jesus Christ and by the Spirit of our God. But these people came to real faith and genuine repentance. Authentic transformation in Christ. We essentially NEVER see such in the abuser, the sociopath, the reviler as Scripture calls them. Yet people like this pastor claim they have a program, they have a system, all of which gives “hope” to people who continue to lie and deceive and abuse. This very Scripture tells us that such people will never enter Christ’s kingdom as long as they walk in evil, which is exactly what they are continuing to do. We are not to counsel them or educate them. We are to put them out from among us and not even eat with them. What About Bob? – He’s a Really Nice Guy, Right? Of course the title of this post is a reference to the movie in which Bill Murray played the agoraphobic, manipulative narcissist – Bob Wiley. The movie was a comedy. In real life, there is nothing funny about Bob. So, what about him? If you focus some attention on Dr. Leo Marvin’s wife, daughter, and son, I suggest to you that you will have a pretty accurate portrayal of the average professing Christian today when it comes to being duped by evil. Here is Mrs. Marvin, the kind, warm, loving type person that most people think a Christian should be. In contrast to her judgmental psychiatrist husband, Mrs. Marvin is accepting of Bob. She invites him into her home, sits him down for dinner, and even permits him to sleep in her son’s bedroom with her son! When Leo tries his best to show her that Wiley is a manipulating, conniving, sociopath working to take over her family, she simply will not hear it. Bob is a good person. And so it is in most every local church today if you pop in for a visit and take a look. Their doctrinal statements speak of the depravity of man, of sin, of coming judgment in the Day of the Lord, but that stuff has just about become archaic in practice. Church signs read “Everyone Welcome” – and they really are. Everyone. If a newcomer says they believe in Jesus, well, they can become a member right away and before you know it they are teaching the kids’ Sunday School class or working in the youth group. Nicest people you ever met, you know. In future posts we will look more closely at these Scriptures and at many others like them. This is just a small sampling of the mountain of warnings the Lord has given us about the “Bob’s” who come along with Bible in hand, smile on face, ready to serve, speaking of Jesus – “just the godliest people you could ever want to meet.” Right. The very foundation of Christ’s truth is to be evidenced in and supported by every local church. That is not the common scenario today however. What about Bob? Bob is soon an elder in the church, welcomed with open arms, the finest Christian anyone has ever met. And Bob’s master is very pleased.